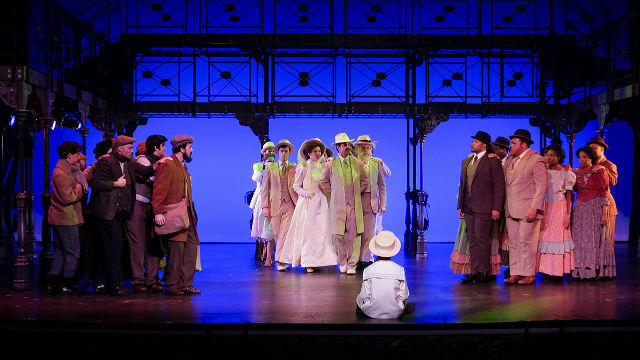 A scene from “Ragtime” at San Diego Musical Theatre. “Ragtime” has one of the great opening numbers. Like “Fiddler on the Roof’s” “Tradition,” it captures, in one song, the entire essence of the musical’s milieu. The show is set in New York, 1902-1912, and in the opener, the three very disparate groups stay squarely in their own space (mostly, in this production, though not as much as they should): the privileged whites, the music-playing blacks and the huddled immigrant Jews. How these factions avoid each other and ultimately, inevitably, intersect is the heart of this moving musical, based on the magnificent 1975 book by E.L. Doctorow, which is ranked among the 100 Best English-language novels of the 20th century. In the white-clad, WASPy enclave of New Rochelle, we meet the archetypal Mother (wonderful, mellow-voiced Carolyn Agan), Father (an appropriately rigid Cris O’Bryon), Mother’s Younger Brother (impassioned Bryan Banville), Grandfather (a crusty, crotchety Ralph Johnson) and The Little Boy (talented, if fast-talking, Elliot Weaver), who seems to have some sort of clairvoyance (his repeated admonition to “Warn the Duke” presages the start of World War I). The Eastern European immigrants include the determined Latvian artist, Tateh (excellent Louis Pardo) and his silent young daughter (Juliet Garbacz). And among the African Americans, there’s the high-spirited and proud Coalhouse Walker, Jr. (commanding Jay Donnell) and his beloved Sarah (engaging Nicole Pryor, confident in a role she’s already played four times). Interwoven with these fictional characters are noteworthy historical figures from all strata of society: African American moderate Booker T. Washington (an upright, moralistic Vimel Siphus); immigrants: anarchist/activist Emma Goldman (powerful potent-voiced Abby Gershuny) and escape artist Harry Houdini (agile, muscular Michael Mittman); wealthy capitalists Henry Ford (versatile Paul Morgavo, who plays a number of roles) and J.P. Morgan (self-satisfied Ryan Dietrich); and the socialite Evelyn Nesbitt (adorable “wheee”-girl Andi Davis). The show, like the novel, is chock-full of still-pertinent issues: the treatment of immigrants and African Americans; wage and gender inequality; upward mobility; moving with changing times and America’s evolving demographics. Coalhouse and Sarah are on the outs at the outset. She and their infant son are taken in by Mother and her family (Father is off ‘exploring’ with Admiral Peary). After Coalhouse is denigrated and his shiny new Model T vandalized by racist Irish firemen, he refuses to marry Sarah until he obtains justice. His insistence becomes an obsession, and tragedy ensues. Meanwhile, Tateh has wangled his cutout silhouettes into moving picture books, and far beyond. His little girl and The Little Boy become friends. Unexpected but foreseeable connections result. The memorable and inspiring score by Stephen Flaherty (music) and Lynn Ahrens (lyrics) includes anthemic songs (“Wheels of a Dream,” “Make Them Hear You”) and heart-rending ones (“Your Daddy’s Son,” “New Music,” “Sarah Brown Eyes,” “Back to Before”), in a range of styles from gospel to marches, ballads to rags. The score and the book (by Terrence McNally) won Tony Awards in 1998; the show was nominated for 12 Tonys, including Best Musical, and won four. For its large and elaborate production, San Diego Musical Theatre brought in Paul David Bryant, who was part of the original Broadway production, to direct and choreograph — which he’s done 11 times around the country (at least one of those with music director Don LeMaster). Bryant generally stays true to the original choreography by Graciela Daniele, but he adds some nice touches of his own. It’s somewhat incongruous, however, that even with a cast of 41, he repeatedly puts African American actors into scenes that should be all white. His cast is outstanding, especially vocally. And the 22-piece orchestra, under LeMaster’s baton, is brash, brassy and confident. The sound was sporadic the day after opening; mics went on and off, it was difficult to discern some dialogue and song lyrics, and Donnell was forced to sing one number without any amplification at all (clearly, this was unintended, but it was refreshing to hear a live unmiked voice onstage). The lighting design (Michael von Hoffman) was overly ostentatious at times, with garish background colors. The bi-level, mostly metal set was rented from 3-D Theatricals, and the attractive and varied costumes were “coordinated” by UCSD alum Desiree Hatfield-Buckley. “Ragtime,” one of my personal favorites, is a warm, energetic, tear-jerking (if occasionally over-reaching) story of America, one that doesn’t feel dated in the slightest. It’s all about our past (and sadly, our present, too). Every American should see it. Performances are Thursday at 7:30 p.m., Friday-Saturday at 8 p.m., Sunday at 2 p.m.